Random Anny .Com: Prison Break returns & I'm ANGRY! Prison Break returns & I'm ANGRY! 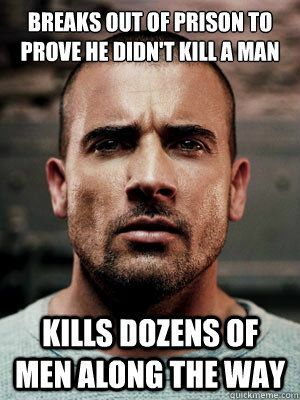 Prison Break was an amazing show - the acting was amazing, writing clever and plot twists aplenty. Yet this whole idea of bringing the show back in just ridiculous! I hesitate to say too much in case you haven't watched it (but really should) so let's compare it to Goldilocks and the 3 Bears. Robert Southey has been dead forever so it must be public domain by now, right? We all know Goldilock's travails with porridge, chairs and beds. In the end she runs away and is reunited with her family to live happily ever after. Now let's pretend Hollywood can't think of any new fairytales so they decide to EXTEND the story. Where would they add another 10 episodes? Is it after old Goldy made it home? Was it on her way back? Why should we care? I mean - we'll care because the precocious blonde was such an important part of learning how to anticipate plot points when reading but why should we continue to be emotionally invested? We read the book, did the report and filed it away. Let's read something new! The bodies are (literally) buried, let the actors age on and collect royalties without potentially damaging their legacy.